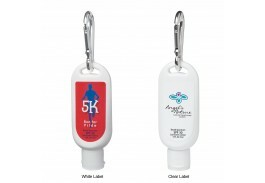 Custom sunscreen is the best way to advertise your business during the summer months, and when you give away sunscreen bottles on a carabiner, it’s like creating a miniature traveling billboard! Customers can clip them to their beach bag, purse, golf bag, etc., so that it’s always within reach, ready to use, and visible to everyone around. 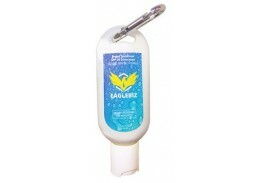 Available in several SPF levels, promotional clip on sunscreen is an effective marketing item for any business and priced right to keep you within your budget while providing maximum exposure. We have personalized clip on sunscreen in bottles as small as .5 oz., which are great for traveling or keeping in a small bag for daily use. 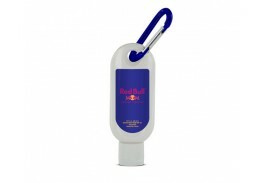 Carabiner sunscreen bottles easy attach almost anywhere. Perfect for golfers, clip on sunscreen is ideal for clipping onto a golf bag for immediate access when reapplying is needed. Fellow golfers will notice your company logo and want to know where they can get one of their own. 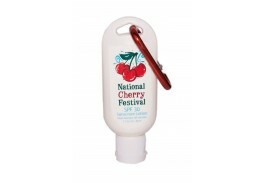 Promo clip on sunscreen is the most convenient way to carry sun protection and promote your brand at outdoor promotional events including tradeshows, sporting events, beach parties and barbecues! Order in bulk today and be ready to have your day in the sun!